Enrich the outdoor experience with the 4' and 6' diamond pattern contour park bench. This contoured steel bench is designed with a one-piece, diamond pattern seat and features solid attached armrests for added comfort and convenience. A simple 2-3/8"O.D. 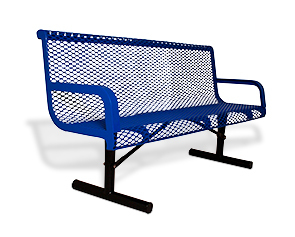 round steel tube, MIG welded and powder-coated frame provides superior support, allowing the bench to be utilized in a variety of applications. Portable, surface and in-ground mounting options available.